So far I have been lucky and Evan has not been sick yet. I am hoping that streak continues and he stays just as healthy. I am also pretty lucky with Jayden because he has only been sick a handful of times himself. But when either of them do get sick I am happy to have the VeraTemp Non-Contact Thermometer. The VeraTemp Non-Contact Thermometer instantly and accurately takes a temperature without even touching. That means you can take your child's temperature while they sleep and not disturb them. The VeraTemp can also be used to get the temperature of a surface or room. 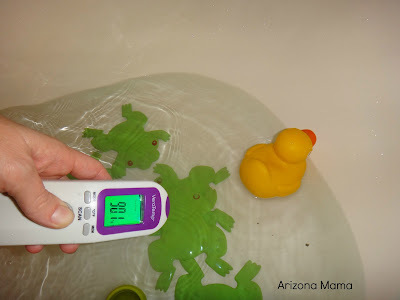 It can be used to check the water in the tub or the baby food in the container. It decreases the chance of transferring germs since it is non contact and does not touch the individuals skin. The VeraTemp does not require the use of probe covers. It has a backlight and easy to read display. It can be used in the dark while you sneak in your child's room to check on them while sick. It has a built in memory and records up to 32 readings. With the Auto-Off feature it saves on battery life. Each VeraTemp undergoes an extensive black body accuracy testing. They are each put through a rigorous accuracy and calibration process. Every single thermometer is tested for proper calibration a minimum of 15 times. I love how easy it is to use. I can take Evan or Jayden's temperature while they sleep in seconds. Jayden loves to check his own temperature with it as well as ours. And in addition to the exact temperature being displayed it also has a back light color to indicate if its just right or too hot. So if your child has a temperature of 101 then it will display 101 and the back light would be red. If the temperature is normal then it will stay green. Thank you to Brooklands Inc. for sponsoring this post and giveaway. I would love to win because with this thermometer, i could check anyone in the family's temp, without having to clean the thermometer. I currently use a rectal thermometer for my toddler, and a separate oral thermometer for everyone else. Every one of their thermometers is tested for proper calibration no less than fifteen times before its packaged and shipped to our customers. The memory button to retrieve the last 32 reading is beneficial when you're on the phone with the doctor! I would love to win this so I can replace my unreliable digital oral thermometer that I have now. I learned you should Point the VeraTemp® 2-3 inches (5-8 cm) away from the patient’s forehead. I want to win this for my 3 grandchildren, my son could really use this. Wow, you don't have to make contact to get the their temperature. No worries of contaminating the thermometer or of waking a sleeping sick child. The display illuminates in a different color depending on their temperature- so easy! I would love to win because my 14yr old has cerebral palsy. Taking his temperature a few times a day is part of getting his vitals by his nurses. This would make it so much easier. They currently have to put the thermometer in his armpit. I learned that the non-contact feature helps decrease the chance of having germs transferred between individuals. I would love to win because I have three wiggly grandchildren, taking their temp. in the armpit is not overly accurate. I like that the non-contact feature helps decrease the chance of having germs transferred between individuals, providing a safe and hygienic way to take a patient’s temperature. I love how accurate it is and that you never have to disturb a sleeping baby/child to take their temp. I want one bad!!!! I currently take my childs temp via the forehead scanner, however I have noticed that it is not accurate! I would love to win this to use on my 3.5 year old and my new addition due in June! This looks really great! My kids are so scared of the thermometer. I learned on there site that you can buy them online at Amazon, Target and Walmart! I would like to win this because right now I just kind of guess on what my kids temps are. What I love most is no cross contamination... I have three kiddos, the youngest still an infant, and this is important. I'd love to win because my youngest has an ear defect that makes him very prone to infections... and our present thermometer is an ear thermometer. :( Not the ideal for this kiddo. I love that you can do it on a sleeping baby and not wake them up! And its great that it is so accurate! I love that it can be done without waking the child up and with a 5, 4, 2 and a one week old and this being flu season, it will come in super handy! I would love to win because taking my kids temperature is a HUGE ordeal! They don't quite let me do it. I usually attempt to do it rectally. It is as accurate as a rectal thermometer! Use it on our soon to be newborn! I like the ease of use. Especially helpful when little ones are under the weather. Learned that it has a button that you can retrieve the last 32 readings! That's great! I'd love to win because I have a 4 month old baby boy who is very squirmy and its hard taking his temperature underarm or rectal so this would be great and I wouldn't have a doubt in my mind that the reading is incorrect :) currently taking his temperature underarm or rectal but again not ever sure if its correct because he moves so much! I learned that the VeraTemp Thermometer is clinically proven to be as accurate as both ear and rectal thermometers. I would like to win this thermometer because I take care of my grandchildren during the work week and it would be nice to be able to check their temperatures so easily when they are sick. I use an old oral digital thermometer. I love that it is a germ free way to take everyone's temperature and avoid cross contamination. 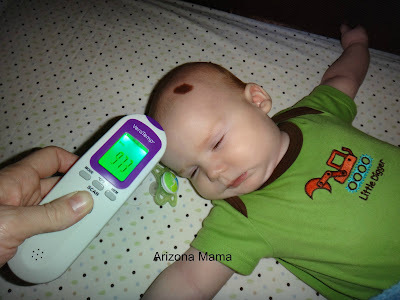 I have to fight with my 3 year old trying to take his temperature with a forehead thermometer. Most of the time I just give up! The idea behind this infra-red thermometer is an appealing one: instant reads from your kids even without disturbing them in their sleep. I learned that a no contact thermometer stops the spread of germs! I like this one because it would be easier to use then the oral or rectal on my newborn. I Liked that the site was easy to navigate. I like that there is no cross contamination. I'm pregnant but when I do take temperatures I usually do armpit. I learned the non-contact feature helps decrease the chance of having germs transferred between individuals, providing a safe and hygienic way to take a patient’s temperature. I learned that they have a rebate going now also! Oh I would love to win to use for little Carter! There has been so many times when he has been sick and we try to take his temp during the night or during nap and wake him up. We currently have the ear thermometer which is not always that accurate! I would LOVE this one so much! I would like to win because my kids are scared of the thermometer and won't sit still long enough to get a good reading! I take it under there armpit. I like that it's so easy to use and still accurate. I learned that The VeraTemp® Thermometer is clinically proven to be as accurate as both ear and rectal thermometers. I take my child's temperature now with an oral thermometer. I would like to win this not for my own kids (who are older) but for my sister-in-law, who is due with a new baby very soon. I learned that the temp will be displayed for 5 seconds. There are lots of benefits that we can obtain from using non-contact thermometers, one is that we can take our loved one temperature without disturbing their deep slumber. Another thing that we can benefit from such thermometer is, we can save our pass readings for us to able to record and to evaluate whether the fever that occurs is serious or not that much.